I got the rest of the cashmere stitches done on this and started the next step - a braid on the side of each outer block. I should have those done by the next picture. It's coming along, but I probably won't finish it for Christmas without a lot of extra time I can't seem to find. I swear this is going -so- slowly. I've been working on it every day, and I am almost done with the inner part now. There's still a border to go around this whole thing. I hope I don't see a chicken for a long time after this. Well, yesterday I said I'd finish these, and I did. My husband's already working on framing them. I think the backstitching helped a LOT and they came out really cute. My son still has no clue it's for him. This makes my eleventh finish for my 25 project challenge and my first non-round robin finish all month. I've been a slacker. I'm hoping to have this done tonight, as I just finished all the cross stitching. Got the last half frog done since Friday evening, when this picture was taken. It'll be one of my Christmas things done. I'll have my husband take a picture and post it when I finish. I started adding the blue in the middle of the little garden area this week. It's beginning to look like something, at least. I think there are about ten different shades of blue in this part. They provide a lot of shade and definition. Time to get more done on it. Since this is the beginning of the Christmas blitz, I'd better work on ornaments, right? This one is on white using Vikki Clayton's silk. It's a free chart called Wheel of Fortune that I downloaded and printed off from somewhere. At least it's started. This is the project I picked for the ANG Cyberpointers (gads, I hate that name!) test meeting. The line drawing itself is from the Classic Stitches website. They suggested using Anchor threads and long and short stitch for it. Their version looked very nice, but I'm the experimental type and was told by my co-committee heads that I needed to "add value" to the project instead of just putting this one out there. So, I managed to add more stitch types to it and stitch from my stash instead of going out and buying new colors. I like the way it's turning out. It's a bit more abstract than the original. I probably would change the buttonhole gobelin stitches on the cottage to something else, but I like the way the stitches are coming together for everything else. I finished off the last bit of the row this week and started the next band, another really big one. It's going into the "after the blitz" pile, and hopefully I'll have more enthusiasm for it after Christmas. I added a lot of the gold this week and it's made the area look almost complete. Still have the turn and bottom parts of this corner and two more corners, but I do feel like I'm making progress on this. It's going to get plugged away on during this blitz. I ended up using some metallic braid this week on the Lady. She, of course, is in my rotation until she's done, since she's on a deadline. I've gotten a bit more done since this picture, and she's at the point where you can tell she's got a form. Froggie number two's body is all done, and he just needs his head and upper arms in this picture. Since it's been taken, he's been completed and froggie number three and last has been started. Maybe, just maybe, I can have it done by the end of the week. It needs to be, so I can move on to other things. This and the chicken are the two projects worked on every day. Because this one is supposed to be -somewhat- small, I'm keeping it on my rotation during the Christmas Blitz. Maybe I can finish it! This week, I added the flare cashmere stitches on some of the arms. The rest will be coming this week, and starting the braids on each of the sides. It's easy and quick to do when I work on it. Lots of Jessicas in this band. I got about five done and had to rip them out because I was off by one thread. Now they're placed right and I'm putting this aside for the Christmas blitz. Expect to see it again in a month or six weeks. I do like working on it, though. I feel so fowl about this. At least it's getting done, now if only I could hurry it along. There's a border around the whole thing too that I haven't even started. Will be working more on it tonight. I want to mail it home! This is one of my Christmas projects. It's a boxtop and designed by Martina Weber. I've made a pretty good start on it. I didn't have to do all honeydew this week, but managed to extend the midnight blue all the way to the bottom of this somewhat-square. I am now truly past the halfway point, even on the honeydew fill in part. It's getting there, but it's going to take a break during the Christmas blitz. I hate to put it aside, but it's for me and it's already behind. I've got pretty much all of the blue on the top part of this corner before turning it done. Now to put the gold in and really get that area looking like it should. This one will be staying in my rotation. It's what I've worked on the longest, and deserves to be worked on more. I am almost done with the left hand arch. I'd run out of the metallic thread I've been using, else it'd be finished. Found some, so it will be done next time I work on it, after the Christmas blitz. Had to do some frogging on the right side; the pots were all off by one stitch. That's fixed now, though. I started stitching this (it's called Buttonholes and Bargello) almost exactly a year ago and finished it, according to earlier entries, early February. My husband finished framing it yesterday. Didn't he do a good job? He designed and made the frame himself. He orders the mats, too, picking the colors he wants to use. I think he did a really good job. We're not sure if we're keeping this one or giving it away. I got the second row of starfles done this week, and started the next band, which has lots and lots and lots of Jessica stitches - in slippery Marlitt. This one's getting set aside for the Christmas blitz, though, so it'll be a few weeks before much more progress is made. When we went to New Hampshire at the beginning of the month, I not only bought quilting and stitching supplies, I bought yarn from the shop next door. The purple/blue/green/white stuff will be used to make an afghan. The single skein of blues and teals I'm going to use in a future needlepoint project. Really, the round robin that I started with my planets was not a poultry one. Not that you can tell from what I've been working on with it. This is the last one I will, and it was at my house before the round robin was cancelled. I feel an obligation to work on it before sending it back. It's rather bigger than any of the others, and it's got no empty spaces in the square - everything's stitched. On top of that, no sign of my planets yet, and still no sign of the autumn exchange I was supposed to get. That was to have been mailed on September 15th. I mailed mine before then. Not even an acknowledgement that it has come. For those reasons ... well, I'm glad it's coming to an end. I don't like dealing with people who do not fulfill their obligations. It's one of my biggest peeves. I'm still sketching the outlines of part three's first side, but it's coming along. I even added non-blue colors. It's coming along, slowly but coming along. Not sure if this is going to get kicked out for Christmas blitz or not. I had to do some frogging on this small band this week - I'd made one of the motifs wrong, consistently. On the other hand, it's done now and you'll see the picture next week. In fact, I've started the next band, so progress is being made! Now to get it moving along more, although this is a likely candidate to be put aside for the Christmas ornament blitz. I don't normally do anything besides crochet in the car - it makes me carsick. That aside, I tried working on this project. Instead of doing the finicky bits in the seahorse himself, I did the sea ... and managed to do a significant portion of it! Who knows? I might even finish it this year. This week I started working on the dress again, on top of the flag. I think it's coming along well, and the picture doesn't do it justice. Now to get more done on it so it's ready on time! I'm beginning to feel the Christmas crunch, and might be putting a couple of my large projects on hold for a few weeks while I work on ornaments and presents. By next week, I'll have made a decision. This is part of the stash I bought last week, and I'm nearly a third of the way done with it. It's a Christmas present for my son. I'm not worried about him reading this blog; it never crosses his mind to. Anyway, I changed out the fabric from the kit's Aida to some linen. It looks kind of cute. Even though I was on vacation, I managed to finish off the scotch stitch part of these rectangles. Next up is the sparkly stuff between them. I might even get to it this week. I -think- I'm finally halfway done on this part of the garden. Ended up doing a lot of filling in again this week with the honeydew. It definitely brought me to the halfway point on the right side, and close to it on the left. This week, I'll be doing more colors. It's getting there! I got more blues done on part three. It's coming along slowly, and of course I'm behind again. What's new? On the other hand, I enjoy the journey and I don't stress over having to get it done by a certain date. When we were in New Hampshire, I found stash! Here's most of my haul. 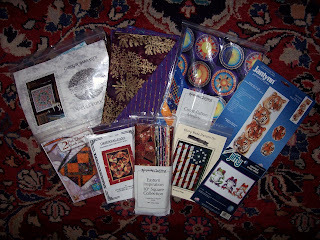 It doesn't break my challenge, though, because I spent money I'd gotten for my birthday and from selling other stash. There's fabric in it and several quilt patterns. 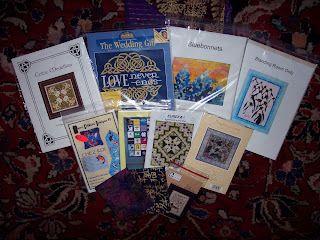 It's been a couple of years, at least, since I've added to my quilt stash. The blues on the second corner are coming out well, of course. I'm almost at the point where the top half just needs its gold put in. That should be this week. I didn't bring it with me on the trip, so it will be Thursday night at earliest that I work on this again. No problems with it and I still love the design. Still working on my scotch stitches for this - and more than halfway done with them. I should be able to finish all of them the next time I pick this up - which should be tomorrow or the day after. I'm on a vacation trip, though, so you never know. So far, since there's -nothing- to do in the evenings here, I've gotten my stitching done then. On the other hand, I went on a stash enhancement today. Pictures to follow soon. This is my other finish of the week - the rooster round robin piece. I sent it home to England this week and hope it gets there safely. With all the full stitches, it went pretty quickly. I know some of you were interested in the pattern. They appeared in several issues a couple at a time in New Stitches a few years back or you can buy the kit through Stitch Direct. To answer Chelle's question on my previous rooster post - I'm currently in two other round robins, both run by British people. One is the calendars and the other is a sealife theme. I'll be doing the French round robin thing again. First I have to get home from vacation and send them a letter. I guess I got spoiled. That was a wonderful one and these others - well, I think my taste isn't the same as the others.